On 5 December 2017, EUROMIL’s President and Project Officer visited the Armed Forces Disabled Veterans Association (ADFA) in Lisbon, Portugal. The visit was arranged by EUROMIL’s Portuguese Board Member A. Lima Coelho, in the context of EUROMIL’s activity plan which foresees greater engagement around veterans (mental) health. ADFA is an independent and non-profit association which was founded in 1974 by disabled military veterans from the Portuguese Colonial War. 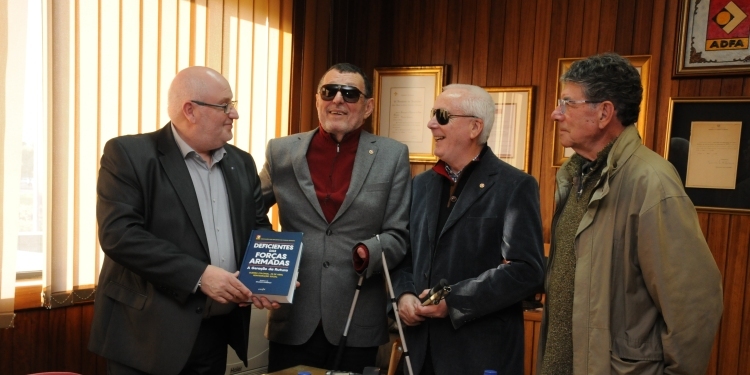 The association aims at ensuring the rights of disabled veterans and offers support in many ways. Social as well as psychological, medical and legal support structures are available in ADFA’s facilities and open to both, members and non-members of the association. At the moment, ADFA has about 13.000 members, organised in 12 local delegations throughout the country. While most them are permanently physically disabled as a consequence of the colonial war, a growing number of members also faces psychological problems. ADFA believes that an integrated approach taking into consideration all needs of the veterans and their families are the best way to support the veterans. ADFA’s President José Eduardo Gaspar Arruda emphasized that ADFA is not calling for charity, but for their members to live in dignity. EUROMIL’s President Emmanuel Jacob thanked the hosts for the insights into ADFA’s work. He considered the experiences of ADFA in the Portuguese context as good examples to be discussed more broadly in the European context.